The artwork that Blizzard has chosen to put into the Diablo III 2012 wall calendar is spectacular. Some of it is beautiful, much of it is gruesome, and all of it really captures my attention. Each piece of artwork makes me want to know more about it. This has inspired me to write a series of blogs about the artwork that is featured in each month of the calendar. This blog is a continuation of the series. The very first thing that catches one’s eye when looking at the artwork for June of 2012 is the bright blue, glowing, ends of a weapon. It is a staff that towers over the person who is wielding it. That person is male, with a closely shaved head, a strong physique, and an impossibly large necklace of circular beads going around his neck and over his shoulders. Our “Mr. June” stands in a background of orange tones that contrast sharply with the glowing blue edges of the staff he holds. If you haven’t guessed who “Mr. June” is yet, there is another clue. At his side rests a large weapon that is designed to fit over one fist. “Mr. 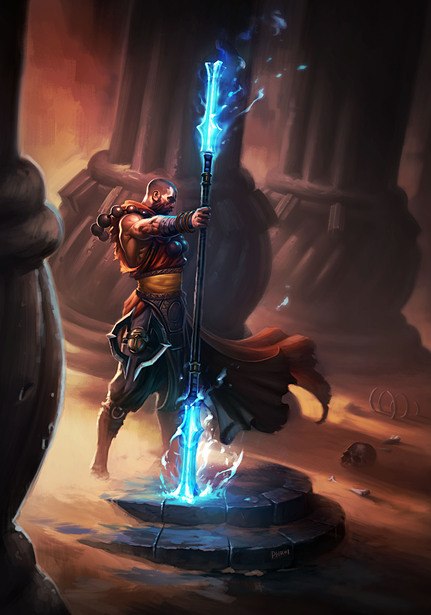 June” is an excellent representation of the male version of the character class called the Monk, (the only class in Diablo III that can use a fist weapon). There are plenty of subtle details that really make this piece of artwork look amazing. From the fine markings on his belt, to the small embers of magic circling around the ends of the staff, to the reflected glow of the staff in the beads he wears – it all looks very realistic. This piece has a dimensionality, and solidness, that is often found in neoclassical paintings. 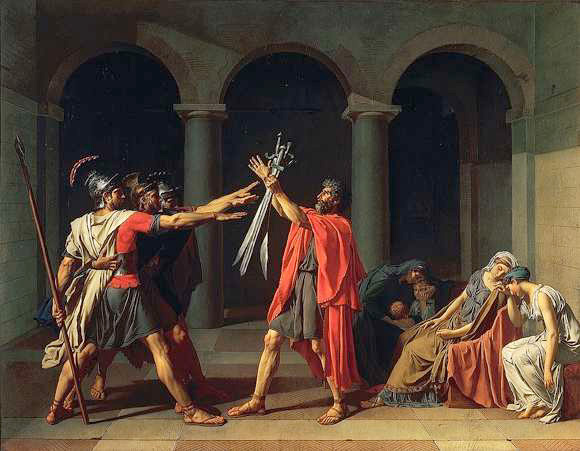 This is a painting called “Oath of the Horatii”, by Jacques-Louis David. 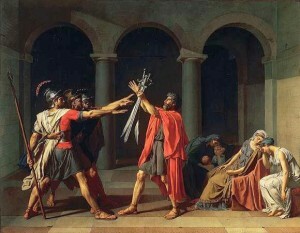 In both paintings, it is clear that the figures have a great deal of strength. You can see the muscles on the Monk’s stomach and on his arm that is holding the staff. You can see the same strength in the muscles of the Roman soldier who is also holding a staff, but in a different pose. His arms and legs look very strong. Both paintings also use shadow in a dramatic way, and are made of a palate of contrasting colors. (David’s piece juxtaposes red with an olive green; the Monk painting contrasts ice blue with a series of orange tones). But, that’s enough of an art history lesson, for now. In this painting, the Monk is standing on a waypoint that is partially buried in the sand. The stones it is made from look solid, heavy, and maybe even immovable. Look closely, and you will see a tiny detail on the waypoint that you may have missed at first glance. It says “Phroi”. “Phroi” is a shortened version of the name of the artist. His full name is Phroilan Gardner, and this is not the only artwork he has done for Blizzard’s Diablo III game. Some of his other work includes the concept art for Caldeum, a few versions of the male Barbarian, and several of the designs for The Fallen. One glance at his website Phrolian’s Stuff reveals that he was the artist that created the piece that appeared on the Diablo III 2012 wall calendar for May. 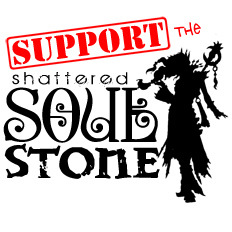 He is using that image for his banner! He is also the artist that created the male Barbarian that appeared in the Diablo III 2012 wall calendar for March. The artwork that Blizzard selected for June of 2012, of the Monk, was featured in Hyper magazine in 2009. (The magazine also included his amazing artwork of the Fallen that Blizzard featured on the wall calendar in May of 2012). It turns out that Phrolian Gardner is a very big deal! In addition to creating wonderful artwork for Diablo III, he has done several pieces for World of Warcraft, Starcraft, and other, non-Blizzard, games. I would not have figured that out had I not decided to go dig up information about the artwork that Blizzard placed on its Diablo III 2012 wall calendar for June. Our “Mr. June” had fascinating secrets to share with us!